The initial setup experience, which we've already given you a rundown of, is quite different from most services. The app spends a good amount of time getting to know you and your tastes. You'll tap (like), double tap (love) and long press (hate) your way through bubbles bearing genres and artists. It doesn't take long, and Beats Music immediately starts serving up musical suggestions based those choices. 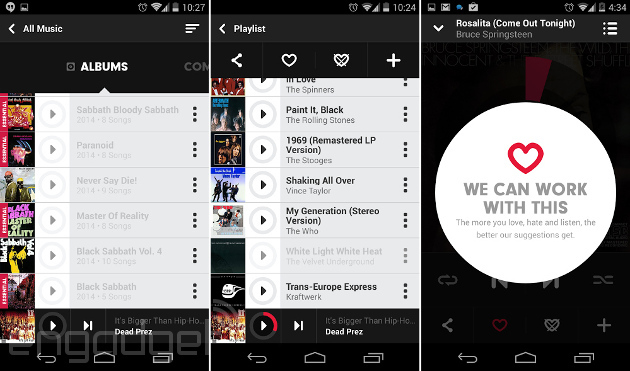 The first tab you see in the app, Just for You, is populated based on your listening habits. So, on first launch it's primarily built around your professed preferences from the "on-boarding" process. But over time, thanks to algorithms created with the help of both behavior and data scientists, it should grow smarter. Granted, in our limited time with the app it was hard to spot a difference. A few days didn't exactly give Beats a chance to figure out the finer details of our tastes (liking Vampire Weekend does not equal liking Fleet Foxes). That said, it quickly learned this editor had an obsession with Bruce Springsteen, and served up a new album from the Boss' catalog every time it launched. Swipe to the right of the Just for You tab, and you come face to face with The Sentence. This is one of the interesting and bizarre features of the app. The Sentence is just that, a Madlibs-style fill in the blank statement. Tell it that "I'm at my computer & feel like partying with my inner child to hair metal" and you'll get an automatically generated playlist of retro rock tunes with big guitars and simplistic lyrics (think girls and partying). Go with "I'm at the gym & feel like running with my pets to vintage soul & funk" and you'll get a selection of treadmill-worthy gems from Funkadelic, Kool & the Gang and the The Gap Band. Of course, odd things occasionally slip in, like the late-era Marvin Gaye cut Third World Girl, but for the most part it does a decent job of matching up with your mood. Besides, just like its competitors, you can fine tune its selections by taping love it (a heart icon) or hate it (a heart with an X through it). You can even share your sentences on Facebook or Twitter and invite others to give the tailored listening experience a try. All told, Beats claims there are a 1,000,000 possible sentences and we're sure that will grow over time. From there, Beats Music turns into a more traditional listening experience. The Highlights tab serves up a curated selection of playlists and albums chosen by taste-makers like former Pitchfork and XXL writers. But there is no personalization to be seen here -- Highlights serves up the same exact content to every listener, such as a themed collection of songs dedicated to Martin Luther King Jr. The same is true of Find It, the next and final tab, which allows you to browse playlists, albums and artists based on genre, activities and curators. If you're planning a summer cook out, the BBQing section under activities has a host of playlists conducive to grilling up some burgers. Wondering what Pitchfork thought the best tracks of 2013 are? You'll find a playlist dedicated to just that under Curators. If you swipe to the left from most screens you'll reveal a pop out menu with a search option that lets you pull up a specific artist, album or song. There's also options here to browse your playlists or your library, the latter of which are songs and albums that you've pinned for easy access. (That's right, no saving albums as playlists here, huzzah!) So long as you're a paying subscriber, you can download any of this content for listening offline and it will never expire and force you to re-download. On the whole Beats has succeeded at building a mobile-first service that offers something its competitors don't. The human-curated playlists are top notch and features like The Sentence allow users to create a more unique listening experience than simply starting a radio station based on a song or artist on Pandora. But there's still a lot of work to be done. For one, there are some glaring holes in its 20 million song catalog. And those holes go beyond expected omissions like Led Zeppelin. Pull up Black Sabbath and you'll discover none of their pre-1980 albums are available. Oddly, they're listed in the artist's library, but grayed out and tapping play does nothing. We encountered the same phenomena with the Velvet Underground's White Light/White Heat, a song sitting smack in the middle of one of those much-touted curated playlists. The other major short-coming (other than some stability issues, which we're willing to forgive in the beta version of the app we used) is the app's design. The company says its guiding principle was to focus on function, and build something simple and accessible for those that don't consider themselves early adopters. But there are plenty of questionable interface decisions. For one, the left-hand slide out menu doesn't work when viewing a playlist or currently playing track. And, while it will function when you're browsing around other parts of the app, the visual indicator of its existence disappears the moment you leave the home screen. It's also far too easy to accidentally open up the right-hand social menu (which is also inconsistently available) when trying to swipe between tabs. If you tap on the track name or album art in a playlist, instead of directly on the play button sitting between those two, you're taken off to the artist's profile rather than treated to a tune. And, if you're already on the artist page, tapping a track title does absolutely nothing. Many of our issues might seem less onerous after getting more familiar with the app, but our initial impression is that the interface is simply too busy and inconsistent. 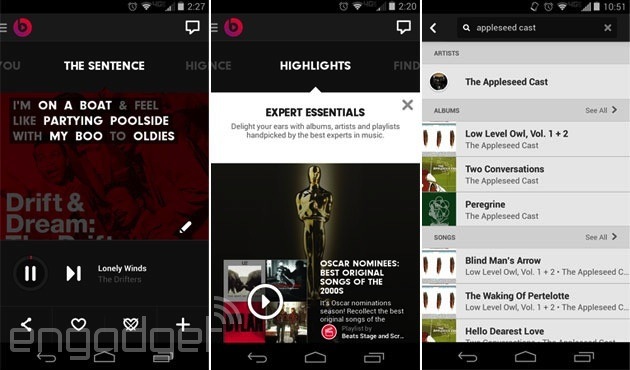 Despite its problems, Beats Music is still a pretty compelling product. If you're not yet hooked on Play Music's ability to plug holes by uploading your own files, or on Spotify's robust social features it's certainly worth giving this new comer a look. It has all the basics down pat and at least partially succeeds in its quest to build unique features around the inherently emotional experience of listening to music. Sure, playlists curated by major music publications aren't quite the same as getting a personal recommendation from a clerk at Other Music, but its a heck of a lot closer than letting Pandora serve up a random series of tracks based on a song's "musical genome." Beats Music will be available on January 21st with subscriptions starting at $10 a month. Those still clinging to their MOG accounts will be migrated to the new service over the next 90 days. Update: By the way, as we reported last week, AT&T has a deal with Beats that allows families to take advantage of the service: $15 per month gets you and four other family members access to unlimited streaming and offline listening across up to 10 devices -- if you're an AT&T customer, of course. There's also a 90-day trial in which your family can check it out for free. Billy Steele contributed to this report.